Your school’s MIS data will need to be correct and up to date so that Xpressions can function correctly. Accurate data in your MIS will ensure that your school community can gain the most benefit from using Xpressions. You’ll need to already be Messenger customer in order to use Xpressions as it uses the same contact information that Messenger receives from your MIS. 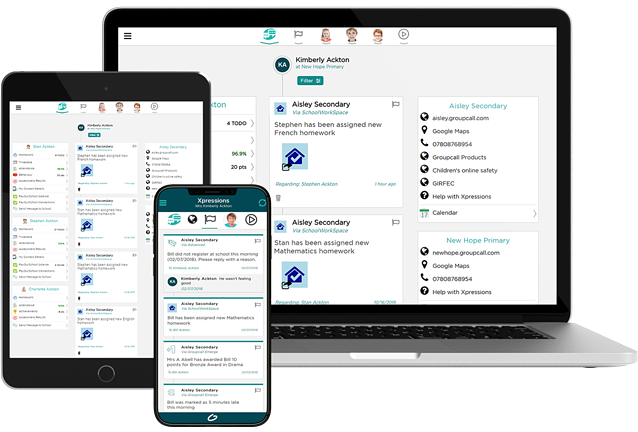 As such, you will need to populate your parent/contact records with email addresses and mobile numbers in order parents to use Xpressions successfully. If you don’t already use Messenger, please click here to get in touch. In order for parents to use Xpressions, both their mobile number and email address will need to be stored correctly in your MIS. Both pieces of information are used to create and verify accounts for parents. If Parent relationships are not defined in your MIS, then recipient selection (in Messenger) will fail as the system will not be able to identify to which contacts the messages should be sent. To clarify, parents that are also staff at your school will need their parent record linked to the student. Parents need to have Parental Responsibility in your MIS. Top Tip: You can perform a Data Validation check in your MIS where possible to highlight any system detectable errors, e.g. people with the same name, to maximise the effectiveness of your data. For more information on how to run these reports and export the data into an Excel file, click here. To ensure your MIS data is effective, ensure that the phone number location for parental contacts is set as mobile in your MIS. Emails will only be recognised by Messenger and Xpressions when stored in the correct format: ID@domain.tld (e.g. jbloggs@gmail.com, jbloggs@school.sch.uk). Emails that are not stored in the school’s MIS in the correct format won’t be pulled across. If your school has signed up to Enhanced Xpressions (SIMS only), parents will be able to see their student’s school photos upon logging in. In the case of parents with multiple children, the image based interface relies on student photos to make it as user friendly as possible. 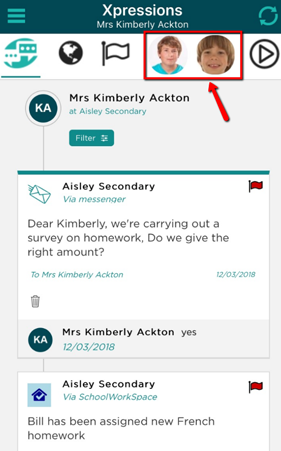 When viewing the timeline, the photos make it easier for parents to filter messages to their child or to a type of message such as Homework Notifications. Parents of more than one child will see all siblings from the same Xpressions account. If a parent has children that attend different schools, all schools will need to ensure that the same email and mobile number is being stored for that parent. It is essential that contacts exist as single records with correctly configured relationships for Xpressions to get the most out of your MIS data. Amy should have the same contact record for Liz linked to her as mother and not a duplicate record as well as having Ben linked as her brother. In this example there should be 3 records consisting of 2 students and 1 contact.